A gunshot echoed across the hills as I joined the many hikers who started their trek down the trail at the start of the BLAST! Hike-a-thon. BLAST! 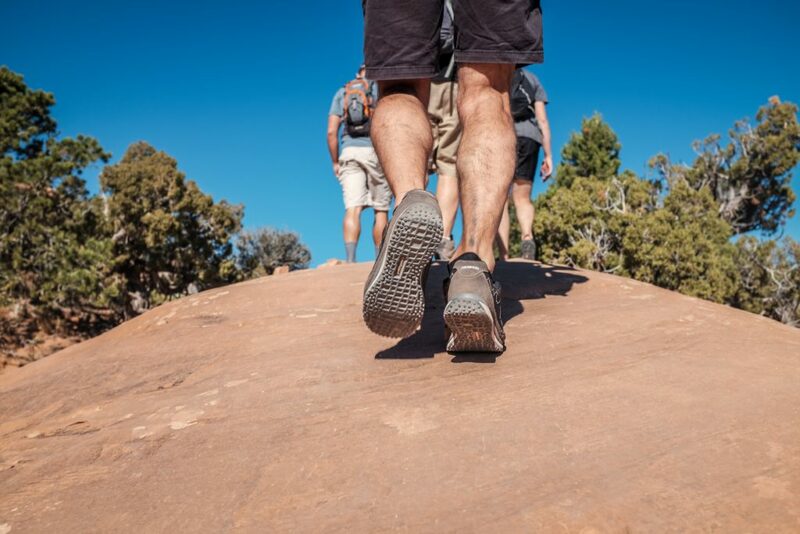 is a 24-hour hiking fundraiser where endurance, challenge, and camaraderie join together to raise money for Discovery Ministries. I have logged many miles on this trail over the years. I might even consider myself a veteran of the hike-a-thon, a seasoned trekker with an understanding of endurance hiking. This year as I prepared for BLAST!, I decided that perhaps I should invite a younger hiker to join me on my quest to hike 50+ miles. That’s how Emma and I became hiking buddies. Emma is 14 years old and has been hiking inthe 24-hour hike-a-thon since she was 6 years old, and she had not yet achieved the goal of hiking 50 miles. When I Invited her to take up the challenge, she didn’t really hesitate, she simply shrugged her shoulders and said “sure, I’ll hike with you”. I was feeling good about this choice and started patting myself on the back for continuing to take up the mantle of challenging the next generation to do hard things. But a few weeks prior to the event, mindset began to shift. What if, i Emma’s youth, she actually challenges me? I may not end up setting the pace for her, she might set the pace for me. I’ve been setting pace for other hikers for a lot of years, but can I actually keep up with her youthful vigor? This the place where God began to show me something about leadership that I know in my head, but struggle to live out in daily life. You see, most leaders get to places of leadership because of the value of their work and can become accustomed to letting others follow our lead or even thinking that everything and everyone else depends on them. It Can be difficult to train up younger leaders and to give them opportunities to actually move ahead of us without fearing it says something about my value or even my future. I am much more comfortable with staying in the lead or inviting others to walk alongside me than I am with letting them break trail, providing space for them to at times lead the way. What’s more, am I willing to let them succeed or fail and not believe that it says something about me and my own success or failure? And when they returned they told Jesus about all that they had done and seen, their successes and failures. Even as they are debriefing their experiences, a crowd gathered to hear Jesus teach. They were hungry and the disciples who had just been out doing ministry turn to Jesus for what to do next. Jesus puts the ball back in their court. He tells them to “give them something to eat”(Mark 6:37). He passes them the baton, giving them the opportunity to take the lead. Now, we know that the disciples fumbled this one as they struggled to grasp the difference between faith in God and physical reality. We know that Jesus, not the disciples,multiplied the bread and fish and there was plenty to eat. This foible on the part of the disciples did not define their future ministry and leadership, though. We see after Christ’s death and resurrection that these men, who could barely grasp the vision Christ was setting before them, were filled with the Spirit’s power and became the bold and radical leaders who carried on the relentless truth that Jesus lived, died, and was resurrected for us. And those men changed the world as they strode ahead and carried the gospel to places it had never been before. You see Jesus knew that these ordinary men would need to follow Him. They would need walk alongside Him and learn from Him. But they would also need to be able to carry on the truth of His life and death when He was no longer physically with them. What would it look like for me to let those who may be younger or less experienced take the lead? Can I trust that my value is not diminished by another’s ability to do what I can do and maybe a little more? Will I have the humility to learn from those who are younger or less experienced than me? Am I seeking to promote myself and what I can do or am I simply being obedient to what God has called me to? Am I willing to lead from behind as well as from the front? These questions and more leave me in awe that God never stops transforming us and teaching us on this journey we are on. Will I stop and sit in the discomfort of what He may be leading me to lay down, in order that He might be glorified?